There is no fool like an old fool and that shoe fits me this week. One of the best days I have had in a number of years was shared with many of you at the Dunnville District Heritage Association’s annual Heritage Day history display on February 17th. For those of you who missed it, you missed a great day. My only complaint is that I found it impossible to take time to see the works of others or to give proper attention to those wishing to share their stories with me. So why am I an old fool? 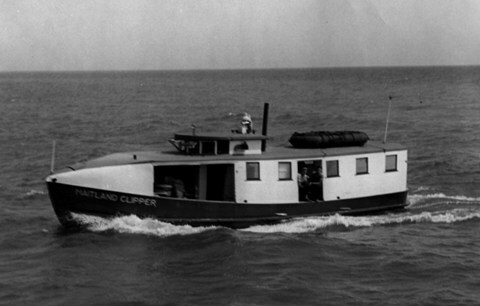 I took my computer to the display and was able to scan a photo of the Dollar Boat loaned to me by Fuzzy Featherstone and the Maitland Clipper from Bill Moyer. I also updated my Moss, McKee and Diette genealogy. A number of people wanted to know how to get in touch with me and for those who had e-mail, I gave them my e-mail address. On Monday I put my computer back together and opened my e-mail. Eleven messages came in. Two of them I recognized quickly. One was from Mary K. Nolan at the Hamilton Spectator. The other was from Betty Neal nee Hicks. Then without warning, bam, my hard-drive fried. Fortunately I had completely backed up my files on Thursday night before dismantling the computer. All the files that is except my e-mail and e-mail addresses. Now I must try to find out the e-mail addresses of probably a hundred people. That is why I am a fool. I never learned how to back–up e-mails or e-mail addresses and still haven’t. I also lost my photos of the two fishing tugs and my updated genealogy. I wish to apologize to any of you who may have e-mailed me from Thursday the 15th of February to Monday the 19th. Your e-mails were fried along with my hard-drive. Please send them again? Much was learned by myself and others on the 17th. Many of you viewed the ariel photograph of Port Maitland taken in 1929 with some degree of amazement. For those of you who did not see the photo it is thirty-seven inches long and nineteen inches high. It was taken prior to the east pier at Port Maitland being split in two. That happened February 25, 1930 when the ice and early spring flooding tore a hole through the pier. You can not claim to be from Port Maitland if you have not enjoyed the benefit of that damage! We have all enjoyed swimming the “break” as it is known. Some of us have nearly drowned in the process including my younger brother Robert and myself. I believe it was the late Tom McIntee who died tragically in a car crash and my sister Margo who rescued Robert. My rescuer’s name is unknown to me. I know who she was. She was a young lady about seventeen years of age whose parents rented the cottage next to where I lived owned then by Frances McDonald. The photo shows us how Port Maitland has changed in just over sixty years and includes the area beginning just off the piers and on both sides of the river back approximately a thousand feet. It continues up river to the bend north of the former Canada Coal Company. I grew up on the east side of Port and remember only a few of the buildings and industries seen in the photo. It was taken in a time when the fish-houses in the Feeder Canal were on the north side of the canal. Over a short period of time following this photo these fish-houses burnt down and were not rebuilt. My grandfather William J. Warnick was Superintendent of the TH&B Railway which owned the land these fish-houses were on. It is said that at the urging of the railways’ president John N. Beckley he constantly pestered the fishermen to leave the railway property and settle elsewhere. Eventually those that remained in business rebuild on the south side of the canal or went to the west side of the Grand. Looking at the picture you can see the Canada Coal docks and the slip for the steam ships. The photo shows us that the break wall forming the “coal slip” was only partly built. 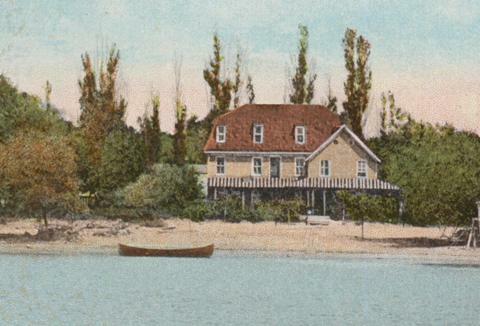 The Ross Fisheries remain on the east side of the river just north of the sand hill now known as Chateaux Côté in reference to the Côté family who now have two cottages there. Dolly Gray’s boarding house is also there. It burnt down on December 12, 1933. I don’t know if any of its owners ever had licence to sell beer but beer was sold openly there. It was built by the Ross family who sold it to Jesse Taylor. Jesse then sold it to a fellow by the name of Harry Ladda who then sold it to Dolly. Jesse Taylor was by and far the best know of all its owners. This was maybe due to the fact that most of the postcards found of it were published during his ownership. All that remains of the old boarding house is the foundation for the ice-house, now being used as the foundation for Jack Curtis’s cottage and the cement pad that the actual boarding house rested on. The pad is now the patio of Ed Boyle’s cottage. All that remains on the east side of the Grand River photographed in 1929 is the old house on the hill which once belonged to my grandfather mentioned above on what is now Chateaux Côté and the former home of the late Tom Spray, now owned by Bernard and Shawn Desmarais. Angus Scott, the boss at the Chronicle and my aunt Madeline keep reminding me that my stories are too long. The paper can only give me limited space and Aunt Madeline likely thinks I am boring and wishes she could just get to the end. Next month I will continue with some of the changes that have occurred on the west side of Port Maitland since this picture was taken. Fish Tug THE DOLLAR BOAT at Pointe au Baril Station ON. Jesse Taylor's Hotel Port Maitland Also known as Ross's Clubhouse.